Modern theories of project management are as ubiquitous as the industries that use them. We have process-based, traditional, lean, benefits realization, and critical chain project management, to name a few. Each method requires new processes, tools, and diagrams that may or may not be working for you. Especially if you manage a small or medium-sized team, intensive processes and elaborate diagrams may require much of your time and many of your resources without returning compensatory value. Fortunately, you may be able to resolve this issue with a solution as simple as project management mind maps. Popularized in the 1970s by author and educational consultant Tony Buzan, mind maps organize related topics around a central or core idea. The core idea is written down, and then subtopics radiate outward from the core idea. Each subtopic can be broken down further and further making a mind map with hundreds or even thousands of end nodes if desired. Buzan claims that this is the way our brains naturally operate, and he calls it “radiant thinking.” All of our core thoughts are connected to dozens of associated ideas that radiate outward endlessly. Because mind mapping mimics this process of thought, it feels intuitive and can help organize ideas efficiently. Improve critical thinking and creativity. Promote idea generation in groups. Improve learning and understanding of concepts. These effects are especially beneficial for project managers. Project management mind maps can help teams that are roadblocked to think critically and problem solve. 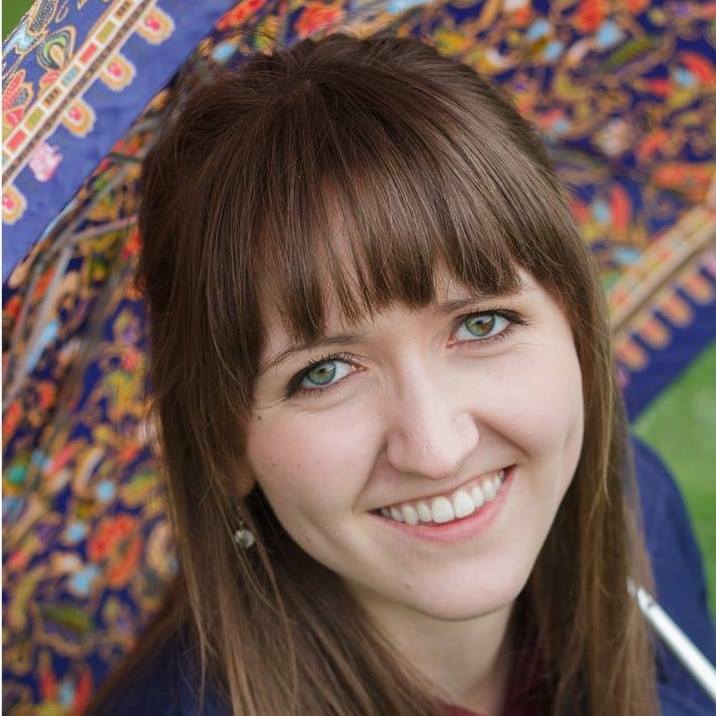 They can be a valuable aspect of brainstorming a new million dollar idea. When starting a new venture, project management mind maps can provide needed context in a way that is understandable to all stakeholders. Creativity, problem solving, idea generation, and group understanding are all benefits that universally facilitate the work of project managers. Managers can leverage the benefits of project management mind maps throughout the lifecycle of a project. Here are just a few ideas. 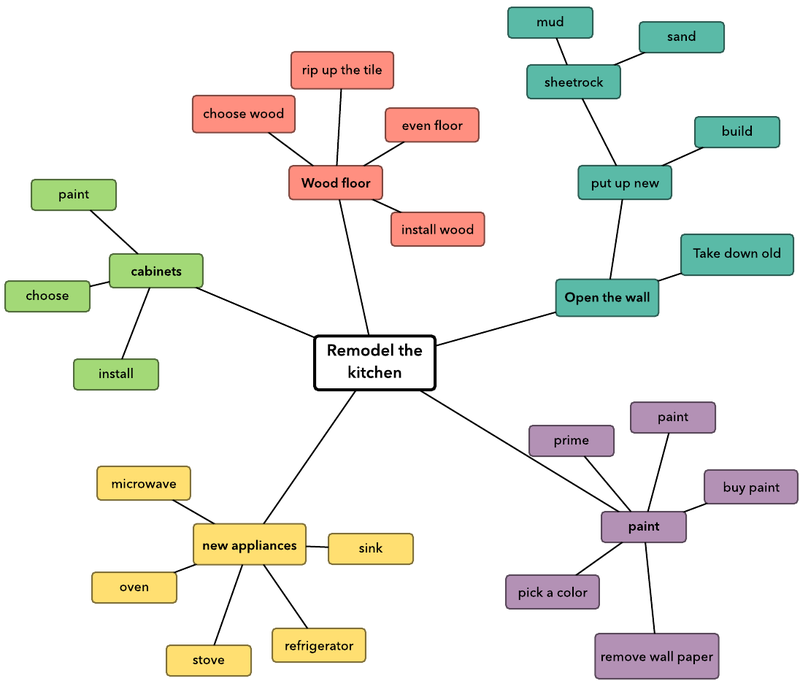 Use a mind map to break projects into smaller project components. For each component, work with technical and decision-making stakeholders to add requirements to your mind map. With Lucidchart, you can have everyone edit the mind map together during a meeting, or separately to accommodate busy schedules. During work meetings, take notes using mind maps. Jot down the main idea of the meeting, and then add branches with ideas, questions, and main points as the meeting progresses. Taking notes with mind maps rather than a bullet list requires the listener to engage with the material, increasing understanding and recall. Turn your project management mind maps into presentations. As opposed to making a presentation that organizes ideas linearly, the organic flow of thoughts in a mind map allows you to adjust your presentation according to the response of your audience. Focus on areas of interest and skip over points that are not engaging listeners. Try using Lucidchart’s presentation mode to turn your next project management mind map into a slide deck. Mind maps organize content topically. Therefore, when built with a web-based mind map tool such as Lucidchart, they function ideally as a central repository of information. Store links, files, graphics, and colleague contact information all sorted by topic. 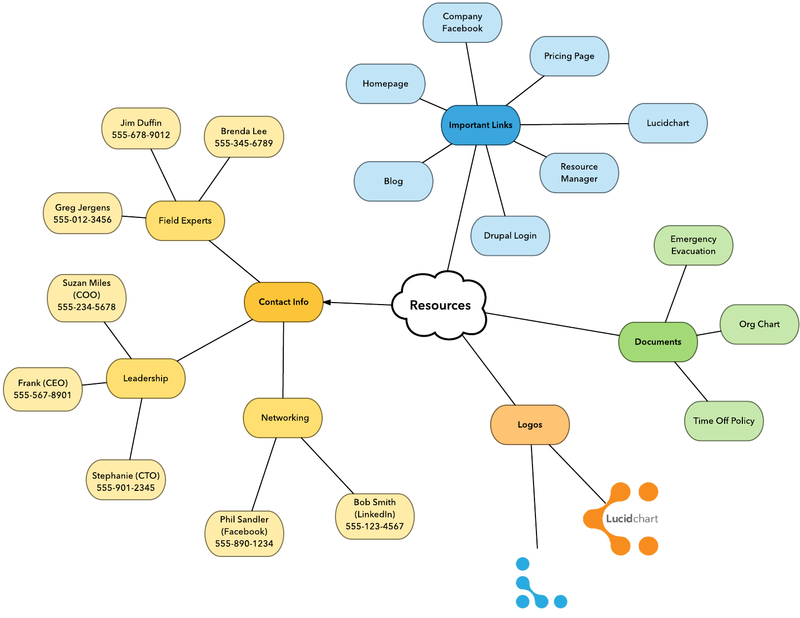 Because this mind map lives in Lucidchart, you can share it with others that may need access to your files. They can open the document to find what they need every time. Ideate with your team using mind maps. Whether you are trying to solve a problem or come up with a new project, sitting down together and throwing ideas on a board is one of the best ways to tackle productivity freezes. 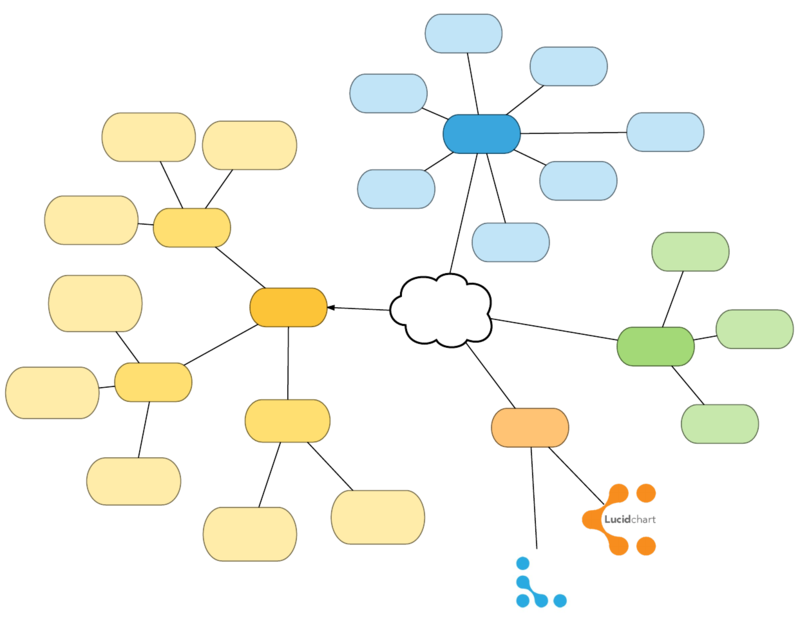 Lucidchart supports multiple editors in a single document, meaning that everyone can contribute to a brainstorming mind map while one person organizes ideas into groups. Mind mapping a to-do list is a skill that can increase personal and team productivity. Think through all of the pieces of a project and then all of the steps that must be taken to accomplish each piece. Once you have mind mapped all of your to-dos, you can rank them by hierarchy of importance in a list. Starting with a mind map before making your prioritized list ensures that no important tasks are forgotten. Likewise, it’s easier to objectively prioritize when all of your tasks are in front of you rather than trying to prioritize from the beginning. Record all of your ideas before you worry too much about formatting and organization. This action helps to prevent writer’s block. For complicated mind maps built in Lucidchart, use multiple layers to filter content, maintaining a simple and visually accessible diagram. Use curved lines, colors, and images throughout. 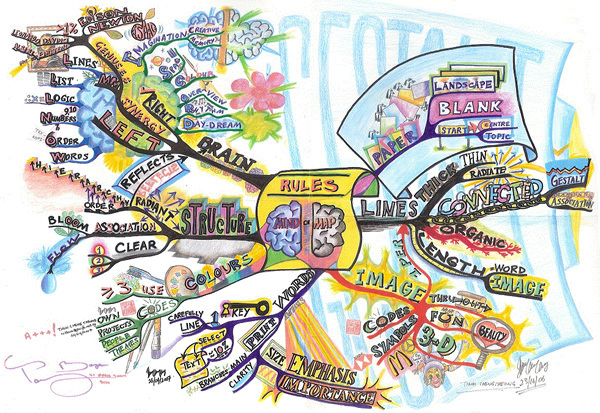 These features make your mind maps more exciting and more engaging for your brain. Are you an expert mind mapper? Comment below with your best tips and ideas for using mind maps.